I first met Jamie when she came into Crooked Tree Coffee and Cakes, the local coffee shop I worked at in Great Falls, Montana. She and her boyfriend Brian, who is in the military, had just moved to town and she was looking for work. When she handed me her resume we hit it off right away! So when I took her resume back to the office I put a big stickie note on it saying ‘She's really great!’ and a BIG smiley face on the bottom. The next week we were working side by side at the coffee bar. Over the next year, there were lots of watching Game of Thrones nights and fun barbecues to be had. Brian and Jamie are one of the most hospitable and caring people I know. Getting to work with Jamie, we had a lot of bonding time. I told her "Brian must be the real deal if you've moved to different states with him several times!" Her immediate response "Oh yeah, Brian is the one I am going to marry." "Aww really?!" "Yes, I've always known, so I'd move anywhere for him" Then she proceeded to tell me her wedding plan dreams. The day finally came to start those plans when Brian proposed to Jamie while they were in Ireland together. I was beyond ecstatic! 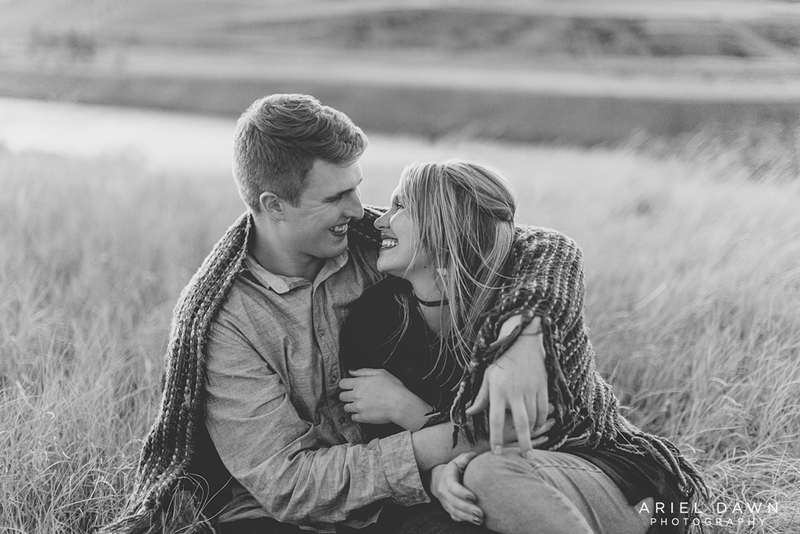 I had already moved back to Bend, Oregon by that time, but since I was already going to be up in Montana to photograph a wedding, I was able to gift them an engagement session! And that's how these pictures were born. It was such an honor to capture their beautiful lasting love. Mosley, their puppy really knew how to be the best model for each photo. How to get fun leaves flying everywhere pictures??? Well, you say "Throw the leaves up in the air!" "Throw them at each other" "Again, again!!" and after repeating that a few times you quickly get some really good stuff and non-stop laughter! Just leaf it to me to come up with leaf and fall puns. This is one of my favorite pictures from the engagement shoot with all the lovely fall colors and the sun bursting through the trees and the couple taking a moment to breathe each other in. Autumn is a like a second spring when every leaf is a flower. 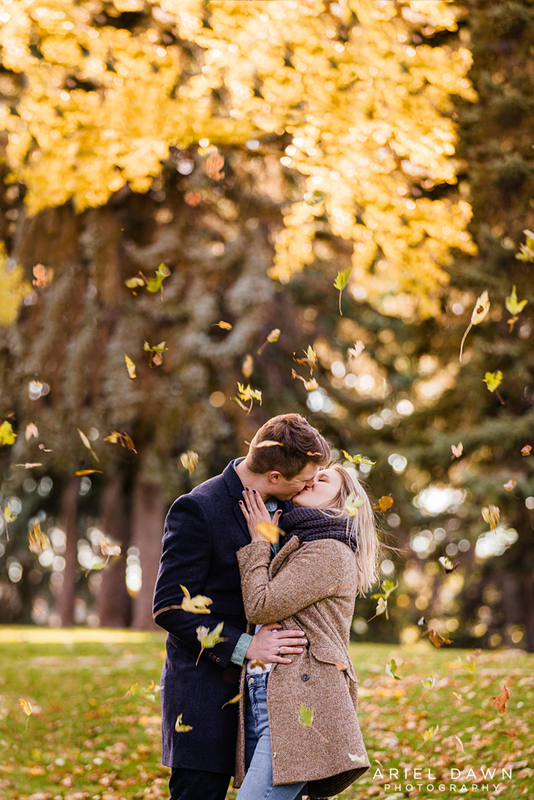 I am so excited that Brian and Jamie are sticking to their fall theme and getting married in October! I love that Jamie made all these cute signs for her engagement session! It just adds extra pizzazz to the photoshoot!!! The sun was starting to go down, so Jamie and Brian did a quick outfit change. After, we headed to a cliff that overlooked the Missouri river. I don't know if Jamie planned to have her nails match her clothes, but they were on point! 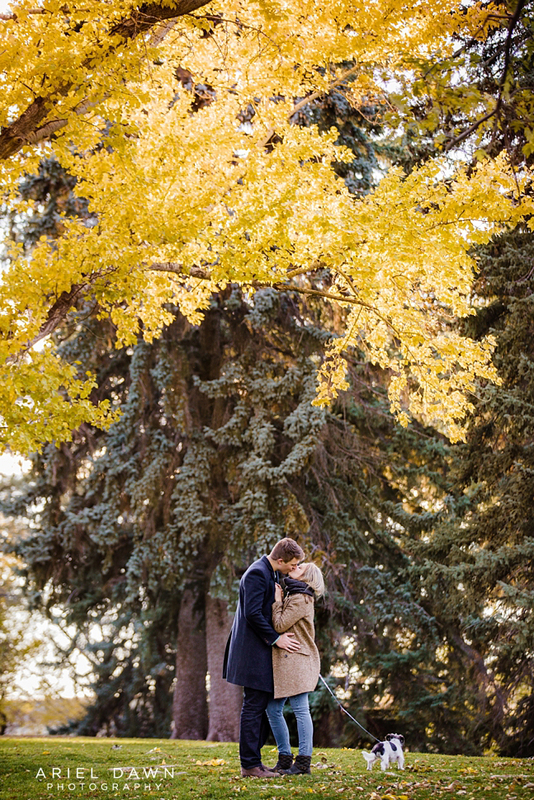 It was starting to get chilly while photographing the engagement session. I told Brian to wrap his arms around Jamie to keep her warm. The rest was whimsically candid. I loved all the gold wheat and plants that were growing everywhere. It went so well with this sunset engagement session. Brian picked out such a unique and gorgeous ring. It fits Jamie's personality perfectly. We wanted to get a few more pictures before the sun was completely gone, so Jamie put on a red plaid sweater and Brian wrapped themselves in a blanket to stay warm. 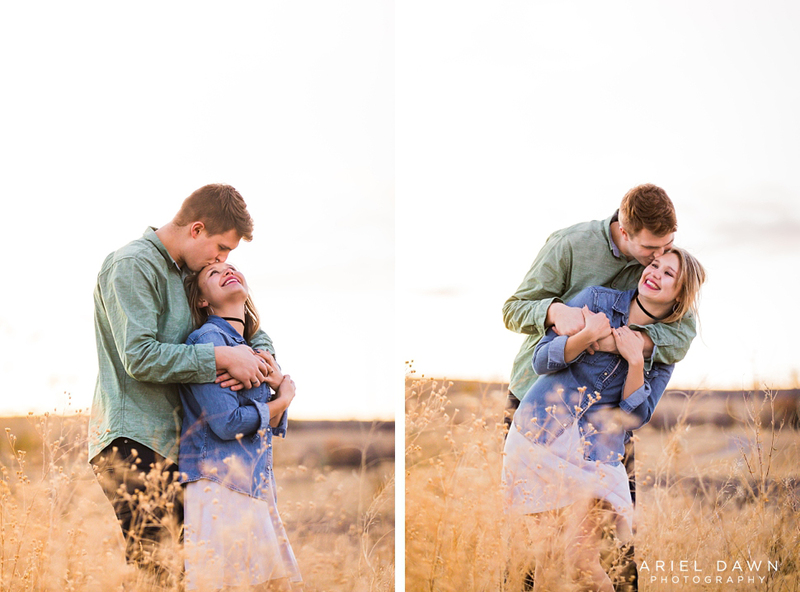 I absolutely adored this engagement session. It was full of genuine laughter and love. Congrats Brian and Jamie! I look forward to seeing your love continue to grow.